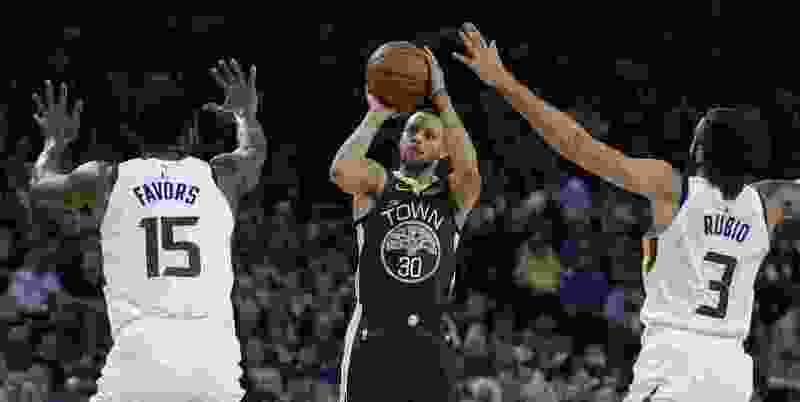 Oakland, Calif. • For all of the second and third quarters, and parts of the first and fourth, on Tuesday night at Oracle Arena, the Jazz were having tremendous success against the two-time defending champion Golden State Warriors. Trouble is, as they all acknowledged afterward, that isn’t enough against that team. Donovan Mitchell noted afterward that it was a series of “just little mistakes … a few missed shots … some turnovers we shouldn’t have had” at both the game’s beginning and end that proved costly. The Jazz wound up 1-2 against the Warriors this season, though all three games were hard-fought and close — a one-point loss on a last-second tip-in in the second game of the season; a five-point victory in the December rematch; and then Tuesday’s 115-108 decision. While an extra victory or two would have been preferable, Utah’s players did at least come away with some level of confidence after the series of close contests. Mitchell is the Jazz’s lone representative in All-Star festivities this weekend, as he’ll take part in the Rising Stars Challenge on Friday. Beyond that, the team doesn’t play again until Feb. 22 in Oklahoma City.